Sunrise Moving and Storage can provide a clean and secure Atlanta storage solution for your business or home before, during, or after your move. Just outside of the quiet northeast suburbs of Atlanta, our secure storage facility is situated in Tucker, GA. Our storage warehouse is a controlled access facility that is not open to the public and provides safe and secure storage for your possessions. Our storage facility is climate-controlled so that your art, leather & upholstered furniture, finished woods, electronic equipment and other such delicate belongings will be kept safe and protected from the harsh Georgia climate changes. What we can store for you? Choose Sunrise Moving and Storage for all of your Atlanta Storage needs! No matter how large or how small your storage needs may be, we can customize our storage facility to accommodate you. At Sunrise Moving & Storage, we don’t just have the storage space you need, but we also have the safety you demand for your storage items. Our facility is equipped with alarms and 24-Hour video surveillance. We also provide convenient monthly billing for our storage customers. 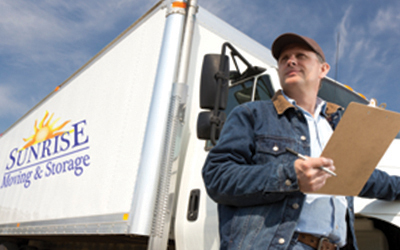 All of your storage items are securely handled by our team of experienced storage personnel. Before your items are placed into our storage facility, our warehouse crew will safely pack, pad wrap, and secure your belongings into a 7′ x 7′ x 5′ wooden storage container that is sealed shut. 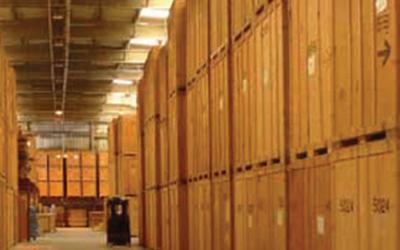 By storing your belongings in our storage vaults, your items will be safe from dust and damage. Other storage options are available as well, so if you simply need short term storage or even long term storage, Sunrise Moving and Storage has a solution for all of your storage needs. Ask a Sunrise Moving and Storage representative for more information about our storage solutions. And of course, we are a full service moving company providing local, long distance and commercial moves. Whether you only need a square foot or even 1,000 square feet, Sunrise Moving and Storage has an Atlanta storage solution for you. Sunrise Moving and Storage is flexible and innovative. So if you are looking for “local storage near me” in the greater metro Atlanta area, Sunrise Moving and Storage is here to help you. Give us a call today at (770) 381-6191 and let our team design a storage plan for you.